Located on a spectacular point of land in a quiet Lake Rosseau bay, Westview is a classic Muskoka cottage of yesteryear with contemporary updates. This 3 bedroom 1 bath cottage has stunning westerly sunset views down the lake and is just minutes from Port Carling & Windermere. Recent updates include: deck, patio, cabin; west facing private point, glorious sunsets and seclusion. Mature open wooded lot, sloping granite shores, ample deepwater dock for swimming, lounging, boat docking. Delightfully situated on an open breezy wooded point facing west in SE Lake Rosseau. This classic Muskoka cottage on popular Lake Rosseau offers privacy, sun, open lake vistas, a large dock for boats, lounging, and clear deep water swimming. Bath, kitchen recently updated. Glorious sunsets from: the spacious living/dining area, your Muskoka chair on the deck or stone patio on the point, or the dock. Minutes by car or boat to either Port Carling or popular Windermere (excellent kids beach, golf, pub patio & ice cream cones) . The main cottage has 2 bedrooms (queen, 2 singles or king), plus sofabed in the Muskoka room; also a sleeping cabin with bunkbeds, ideally max 4 adults, 4 kids. The setting and buildings have a cottagey atmosphere with pine floors, pine kitchen cabinets, stone hearth/air tight stove with lovely lake views from within. Easy level access with car parking within 15' of the entrance. A natural terrain lot, this property has lots of sun but also shade for hot summer days. A natural path & steps lead from the cottage to the water and L shaped dock with lots of room for 1 or 2 boats. Deep water swimming from the dock. Location is on the SW side of Long Bay in SE Lake Rosseau. Dock faces west towards Tobin's Island. Shoreline is mostly Muskoka granite sloping into the water. Cottage sits close to the water with deck and stone patio having a wide lake views - lots of Muskoka chairs. Glass table/patio set on deck with BBQ. Extensive shoreline with picnic table at waters edge, plus sunny upper games/ garden area - horse shoe pitch/badminton. New flat screen satellite TV with DVD player. Small dog on approval, with add'l $50 cleaning fee and pet waiver. total 4 adults and 4 children. Not suitable to 8 adults. Located just minutes from Port Carling, the hub of the Muskoka Lakes with it’s trendy shops and restaurants plus numerous ice cream shops, this family cottage is the perfect spot for your summer vacation! 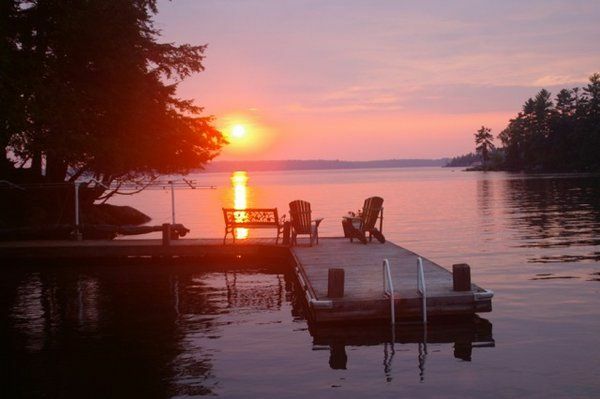 With it’s full westerly views of Lake Rosseau you will enjoy all day sun plus glorious sunsets. On Thursdays there is a farmer’s market in town. Lots of room for kids to run and play and swim with a shallow sandy area at the shore and deep water off the dock, young and old alike will love being outdoors! Cruise the big three lakes by boat, and explore the bays and inlets by kayak or paddle board. Enjoy walks, running, and cycling on the hilly cottage roads. End your perfect Muskoka day with a campfire by the lake!